I want to do something a little different today. As it turned out, I need a couple more days to refine the projects I had originally planned on posting. It's been a while since I've written a post about everyday life around here. I've had this subject on my mind for a several months. It hasn't been until now that I've taken the time to sit down and share it with you guys. I went on a trip to Kenya when I was still single and in my early 20's. While I was in Kenya, my team and I visited Kibera, the largest slum on the continent of Africa. We had to walk in and out of the area on foot, and were not allowed to bring bags, or anything of value. The people were dressed in dirty rags. Sewage and trash filled the streets and the smell was terrible. It was a memorable experience, to say the least. Twelve years later, I still reflect back on that experience from time to time. My husband and I own our home (well...as long as we pay our mortgage! ), we have two cars, and plenty of furniture, clothes, kitchen gadgets, appliances, and a multitude of miscellaneous possessions. Society tells us that we can never have enough possessions. There is always something you need to make your life better. Happiness can be found with every new item you purchase. This is false. True happiness is not found in possessions, but in God. Nothing else. Living in our society is truly a blessing, but I've found that it's important to keep our consuming desires in check, especially when you consider the living conditions in poverty-stricken parts of the world. A couple of months ago, Joel and I had a difficult time getting Mac to put away his toys on a regular basis. 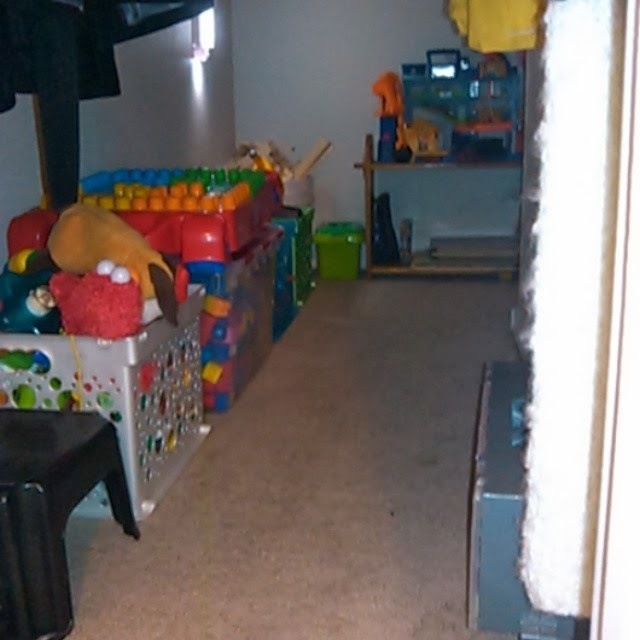 Regardless of the fact that I rotated out his toys, and sifted through them on a regular basis to get rid of the junk, the conflict never seemed to subside. The toy situation consistently escalated into a tense conflict. During these moments, I would remember the Kiberian slum that I walked through as a young adult, and would feel a terrible sense of guilt. The people inside that slum struggled on a daily basis to find enough food, shelter, and clean water, and yet my son had so many toys, that he was overwhelmed with the task of taking care of them. I finally realized that both of my boys had too many toys. This is the closet where the boys store their toys. It's actually worse than it looks. The floor was completely covered in toys. The ironic part is that Mac was looking at the Fire Safety plan. After this realization, Joel and I came up with a game plan, also known as The Toy Purge of 2013. (Just kidding...well, sort of. We really do call it that when we joke about it.) I sat Mac down and explained to him that since he gave us such a hard time each time he had to put away his toys, it meant that he had too many. I told him that we had to get rid of some of them. So, we set aside a day and sorted through all of the toys. Mac picked out his favorite toys to keep, and we got rid of the others, including the broken toys. It was a hard day for both Mac and I and there were plenty of tears, but after it was over, we had a smaller, manageable stash of toys. These are the toys we chose to donate. Part of me still feels bad that we had to get rid of these great toys. This is the closet after The Toy Purge. Still plenty of toys, but so much more manageable. We ended up giving away 3 trash bags of toys to a local charity and since that day, both of them have forgotten about the donated toys. The boys seem to have a better appreciation of the toys they kept. 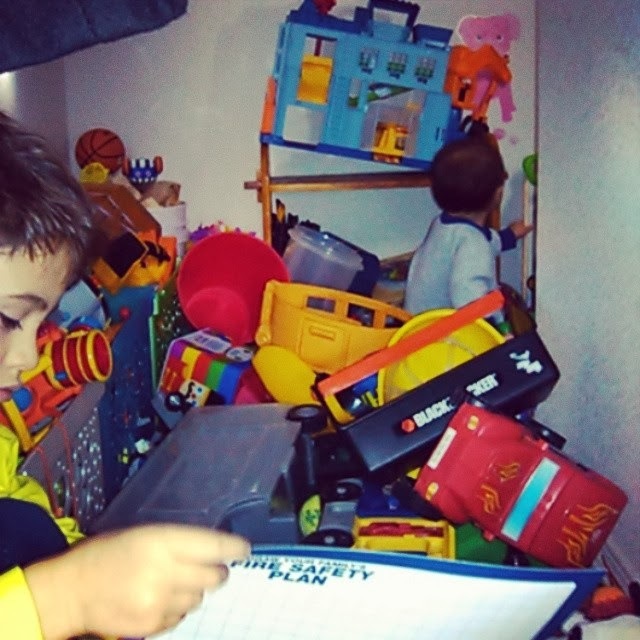 Since The Toy Purge, the conflict surrounding the toys has significantly decreased and both boys no longer seem overwhelmed by the sheer volume of the toys in their possession. It was definitely a difficult thing to go through, but it was a good reminder of what is truly important. 1. We live in an incredibly wealthy society and, as parents, we always want the absolute best for our children. This often includes material possessions - toys, clothes, a matching furniture set for their bedroom, perfectly decorated rooms, etc. None of this is bad, but it's important for us to know when to draw the line. 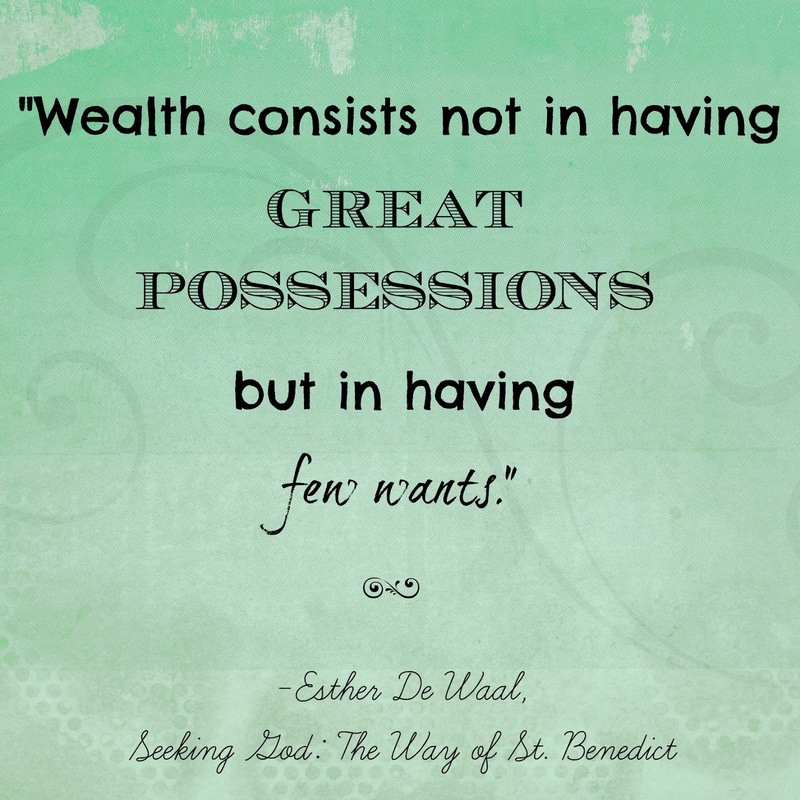 We have to remember what is truly important - material possessions are not. 2. As Mac and I sorted through his toys that day, he would often tear up when I made him choose toys. Those were horrible moments for me. As my son mourned over choosing between his toys, I felt like someone was ripping my heart out of my chest. I wanted to cry too. I want my children to have an enriched and full life and to be a part of every blessing possible - toys included. I felt like I was robbing him of these blessings when he was forced to choose between his toys. I felt like the meanest mom in the world. During those heart-wrenching moments, I had to remind myself that my children will not have a less-enriched life if they only have one toy fire truck instead of three. 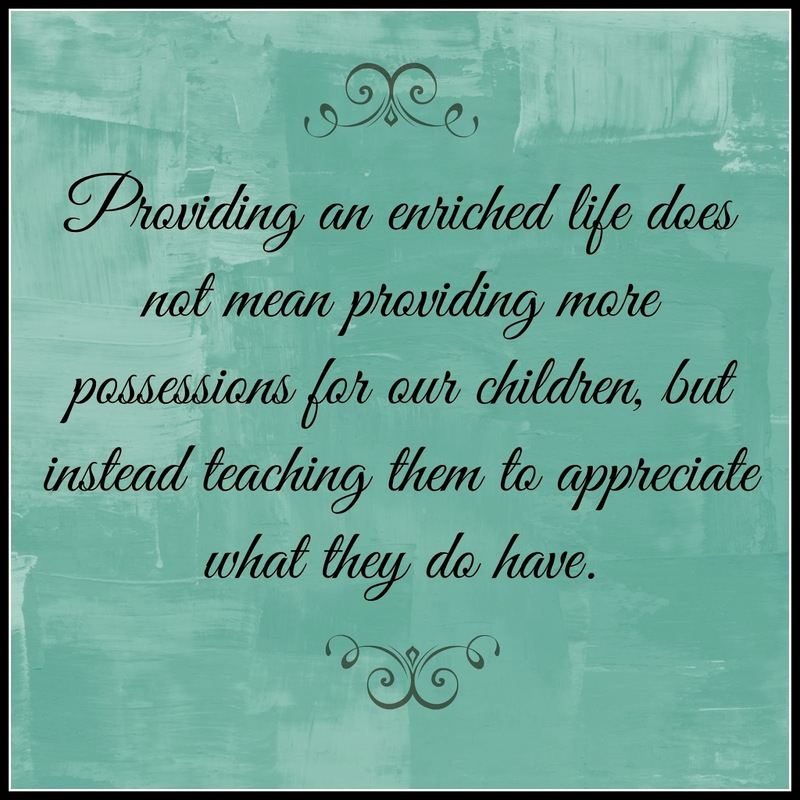 Providing an enriched life does not mean providing more possessions for our children, but instead teaching them to appreciate what they do have. The Toy Purge of 2013 was a difficult experience, but an important one for our family. What we learned from The Purge continues to effect our family's perspective on a daily basis. Last night, Joel and I were sorting through several boxes in our office to donate to a local charity. It wasn't easy, and we had some difficult moments. We had to remind each other of what is truly import. This morning, Mac gave me a hard time when I made him clean his room before school until I turned on the timer and told him I would donate every thing left on the floor when it went off. His toys were picked up with five minutes to spare. (We've made a lot of progress.) 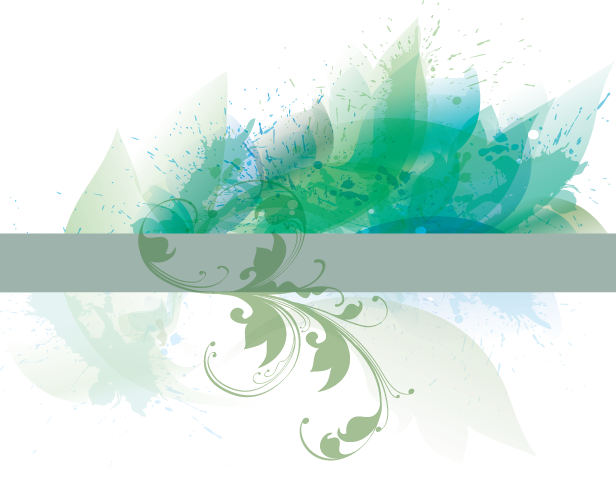 Life lessons aren't always easy to go through, but we always come away with renewed perspective about true value. I loved this post and I LOVED the title! We do purges around here often and donate to charity. In an effort to teach our children the same lesson you are trying to teach Mac, we have them donate one of their Christmas gifts to another child. I always struggle with where to draw the line with my own things. We just bought a house and there is so much that I want, but can't have yet. I often think back of where I used to be and where I am today. I am so blessed!!! We have so much, yet act like we have so little. Thanks again for this post. It further emphasized on the same feelings I've been having. 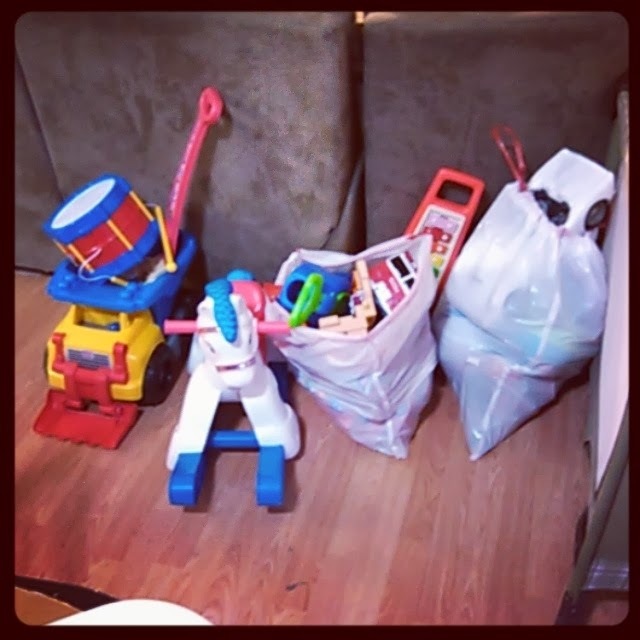 We do this less now that the kids are older and just have less of the little preschool toys, but my kids were used to a regular purge about twice a year. Another thing I did when all three were toddlers was box up some toys and store them in the closet for rainy days, long school breaks, etc. Then I'd bring it out and they acted like they were new!